In the ecommerce world, customers don’t walk into your store, grab a cup of complimentary coffee or tea, and leisurely browse the items for sale. The closest thing you can offer them to physically experiencing your products and brand is the shipping box and what’s inside of it. We’ve written about the importance of branded shipping boxes. You can check out our most recent article here. In addition, in-box marketing materials are a terrific way to communicate with your very valuable existing customers. 40 percent of U.S. online retail sales come from returning (shopped at a site once) or repeat (shopped at a site more than once) shoppers who collectively represent just 8 percent of total ecommerce site traffic. Returning and repeat customers spend more per order than new customers. Adobe points out that a returning shopper will spend three times as much as a new customer on a per order basis, and a repeat customer will spend about five times as much as a new customer, again on a per order basis. 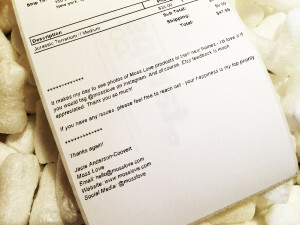 ShipStation customers can easily customize Packing Slips. You can learn how, here. If you sell shirts, you probably don’t need to include “How to Use” instructions. But for some products, it’s helpful to include them. Of course, this information is generally on your website, but buyers appreciate having the information immediately in hand when they want to use the product they just pulled out of a box. In addition, this may eliminate the number of returns you receive. As Dale Carnegie said, the sweetest and most important sound in any language is a person’s name. We’re pretty sure that “Thank You” is in the Top Five sounds. Using a printed postcard does double duty here (and helps save money). On one side is the Thank You, and on the other side are Helpful Hints. Very rarely is there such an obvious, exponential way to increase online sales for a small amount of time and money. So get started on this today. And keep us posted on how in box marketing materials are helping your sales. May I speak with your customer service? I have a few question to ask to help me fully understand about your services. Hey Stan! Reach out to us on our Contact Us page.